It has been almost two years since we first looked at the latest generation of the Honda Accord Sport. Our first test took place at night time, so we were unable to get any good pictures or even get a good look at the car. 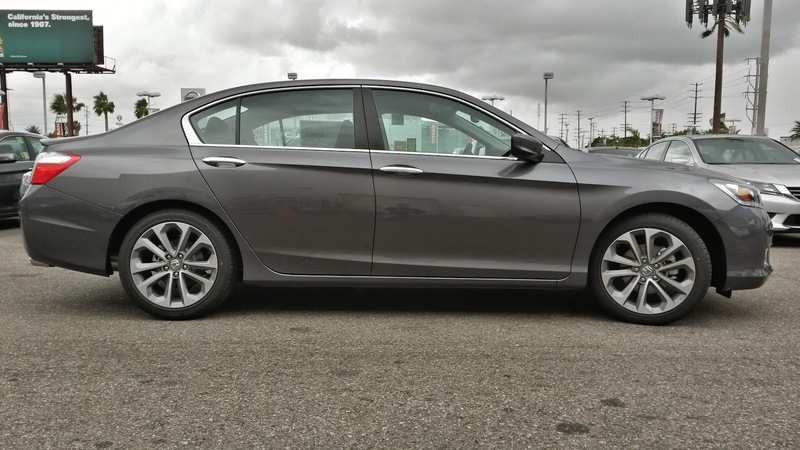 As I am currently considering a second car to use as a daily driver, the Accord Sport popped back up on my radar. I figure now would be a good time to give the car another review to see if our initial impressions of the car still hold up now that the ninth generation Accord has been on the market for two model years. Inside, the Accord does not quite feel as big as we remembered from the first time East Brother and I tested the car. This might be because our 2014 Acura RLX has similar interior dimensions. Having gotten used to the RLX, it does not feel quite as cavernous as the first impression, but it is still quite a large interior. As always, the interior materials of this car seem to be a step above the rest of the competitors in the same class. Most of the plastic bits look or feel of solid quality and the seats are still very comfortable. During our first test drive of the Accord Sport, the dealer had removed the shift knob to prevent theft, but ended up losing it anyway. The salesman who took us out on our test drive ended up having to "borrow" the shift knob out of a Civic Si. Now that I finally get to use the correct shift knob, I have to say that it feels much better in my hands than the Civic Si shift knob did. It certainly looks classier too. As for the rest of the car, not much has changed since we first tested it. From a driving standpoint, the car remains unchanged from our initial test drive two years ago. The 2.4 liter "Earth Dreams" inline-four still pulls nice and smoothly. The six-speed manual still shifts cleanly and precisely. One of our initial complaints was about the car's electric power steering. When we first tested the car, the steering felt overboosted and a bit artificial and, unfortunately, that still remains. Personally, I had hoped that enough people would have complained that Honda would have fixed it, much like how enough complaints about the Infitini Q60's "steer-by-wire" system caused Nissan to drop it from the car. In our first review, both East Brother and I lamented the fact that Honda equipped the Accord Sport with such terrible brakes and tires. 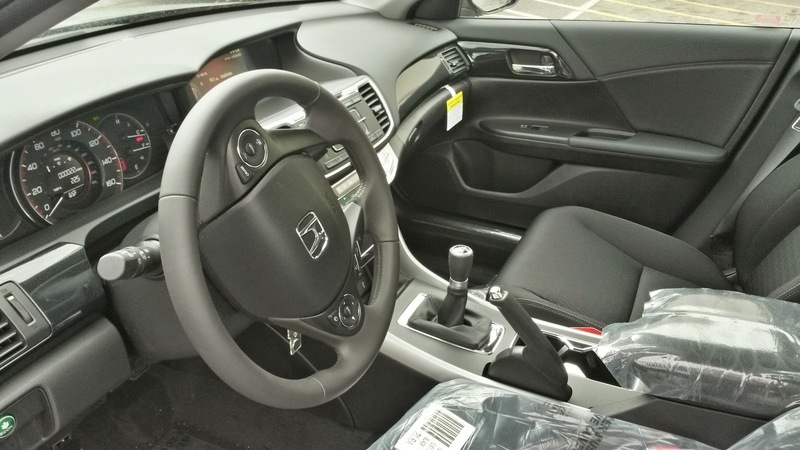 While this generally seems to be the case across all Honda models (the exceptions being the Civic Si and S2000), the terrible brakes and tires really posed a problem during this test drive. My test drive took place on a gloomy and rainy day. I noticed that every time I had to stop, the ABS would engage. Just like our RLX, the brake pedal on this car is extremely touchy. Unlike the RLX though, it seems to take a lot more force to get the car to a full stop. The first time I felt the ABS engage, I thought I was perhaps stepping too hard on the brakes and would need to brake earlier. I tried to brake earlier, but as the car was just about to come to a full stop, the ABS would engage again. This continued to happen throughout the whole test drive. The tires Honda equipped on the car are absolute garbage in the wet. When I first saw that Honda decided to equip the car with the Bridgestone Potenza RE97AS, I figured they would be relatively decent tires. Turns out I was very wrong. When trying to get the car going from a stop in the rain, I could feel the tires losing traction, followed by the car's traction control kicking in trying to fight for grip. And just like the ABS issue, this continued to happen throughout the entire test drive. At no point did I ever try to drive the car hard like I would with my own S2000, so the tires constantly struggling for grip from a dead stop really bothered me. When I later read reviews about the tire, most people also complained about this tire's poor wet weather performance. 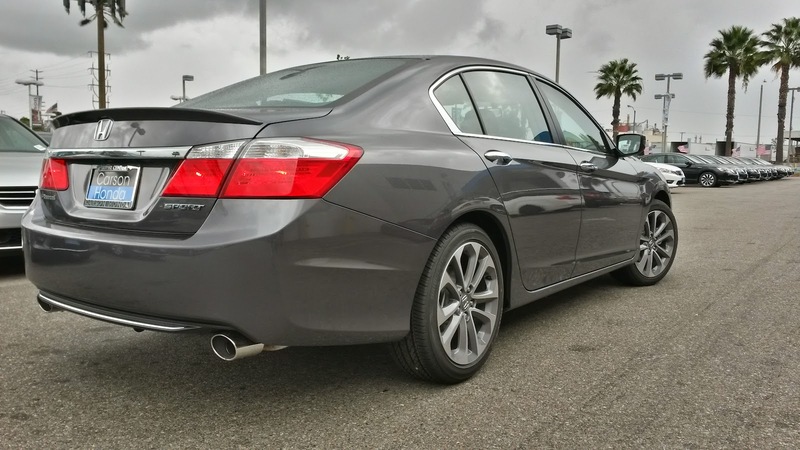 I admit that this test drive definitely shined a new light on the Accord Sport for me. Overall, it is still a pretty decent car. 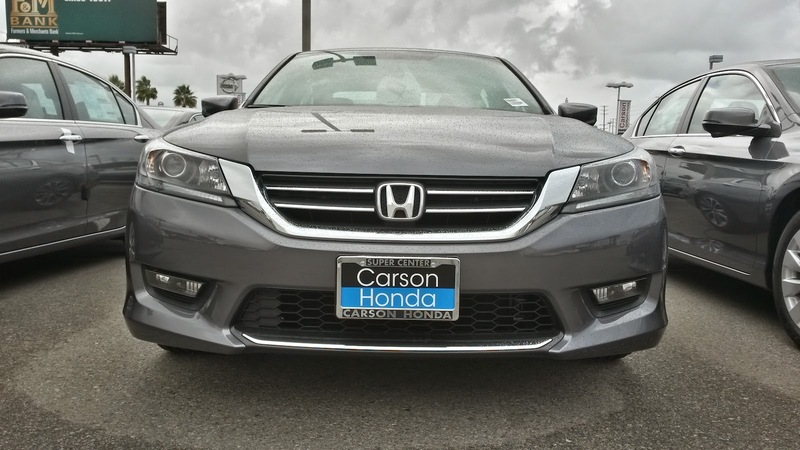 Considering the car's appearance, equipment, engine, and fuel economy, I can see why the Sport is one of the better selling trims in the Accord line up. However, I do find it difficult to convince myself that I would be OK spending $22,000 on a new car, only to have to spend an additional $1000 on a new set of brake pads and tires so the car will not try to kill me in the rain. Of course, it does not really rain that much in Southern California, and I probably would have purchased a new set of brake pads and tires for this car regardless of the weather. 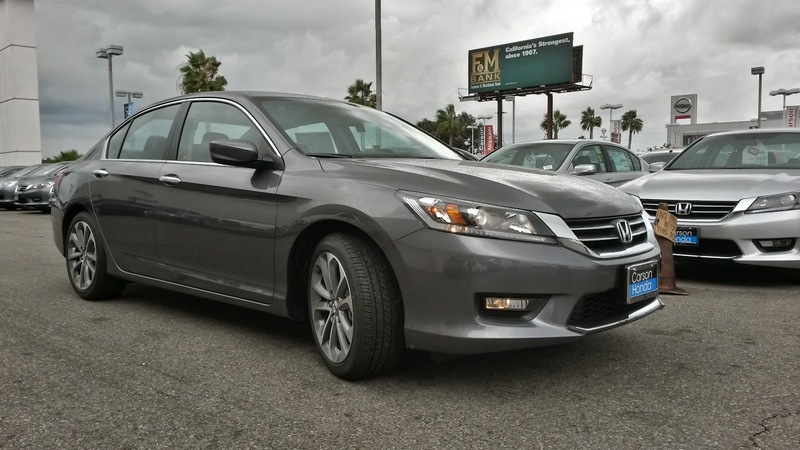 Since the only other car in this segment with a manual transmission is the Mazda6, I would have to say that the Accord Sport is most likely still a contender, but the competition continues to get increasingly stronger every year. 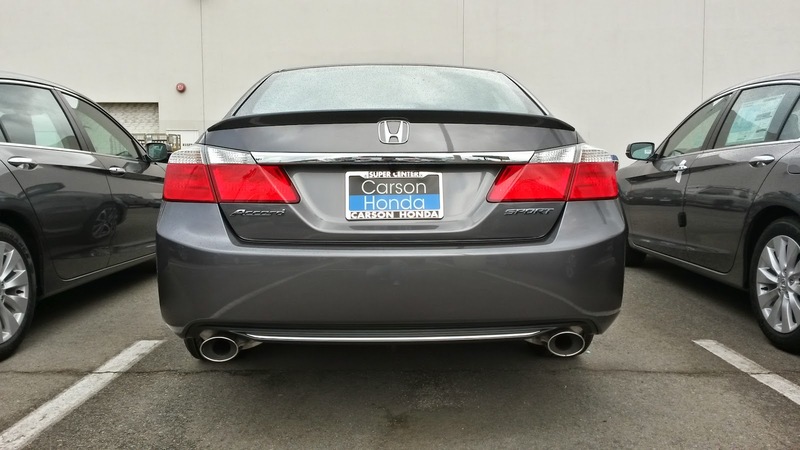 Special thanks to Carson Honda for allowing me to test drive one of the few manual Accord Sports in the South Bay!